My first time in Seattle, WA. Arrived late Friday evening, and caught a red eye return flight to JFK late Sunday night, back to work Tuesday morning. It was a great getaway with good friends and great food. 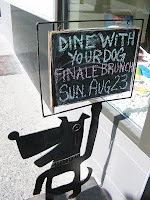 To sum it up, it was really a sleep less in Seattle, but eat more kind of weekend. 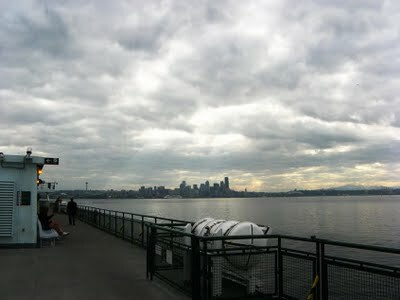 7:30 am Saturday morning, we took the ferry over to BainBridge Island. 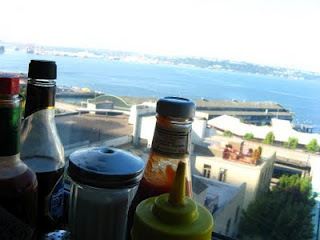 Our first brunch, followed by eating all day and a trip to Tacoma’s Museum of Glass. 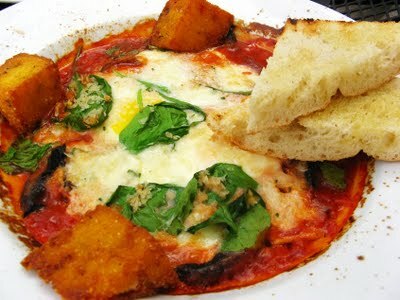 Italian Baked Eggs, so perfect for Brunch. Sweet and tangy charred tomato sauce, melted fresh mozzarella, with spinach and earthy portobello mushrooms, perfect for dipping with the toasted focaccia. Steaming hot and really fresh flavors are contrasted with the fried polenta cake which had a good crunch and nutty texture. A variety of textures in every bite. So satisfying. Maybe eggs on pizza wouldn’t be a bad idea! 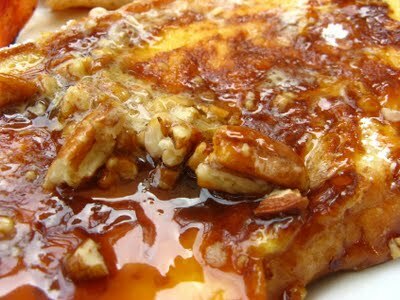 For something sweet and savory, the Caramel Pecan French Toast. 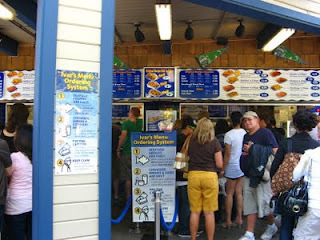 Did I mention, the menu says “food network favorite“? How can it not be? it has all the components that are oh sooo good, but oh so bad for you, hey I ain’t complaining, this is what eating is all about. 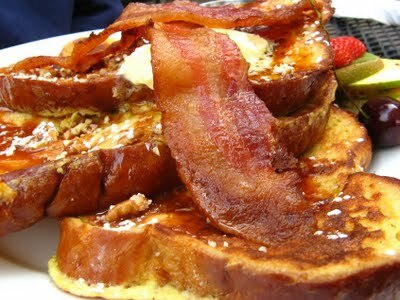 The bread was fresh and french toast perfection, soft and warm on the inside with a thin crust around it. 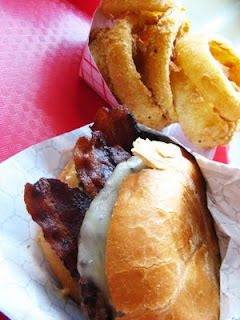 The bacon strips were thick and crispy enough (I don’t like mine with extra crunch that when you bite it falls apart, I like a little bit of chew on my meat). The pure maple syrup, was sweet and fragrant, plus the generous chunk of orange bourbon butter added a citrus hint and the pecans were a good addition of texture to this soft and gooey mess of deliciousness. 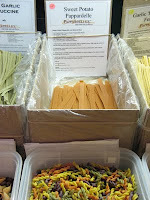 Oh yeah there was some fruit on the side, but who are we kidding here, that was more like a garnish. Followed the crowd and some guide books, I was sure this place would be a hit, but then again, the piers are sorta touristy. Any how, I was a tourist, so there I was, excited and anxious. Their method of ordering kept me entertained while waiting and waiting for our food, but it only went so far, sorta like the Soup Man (ala Seinfeld). From the joy of my expression, you can see this was pre-tasting. 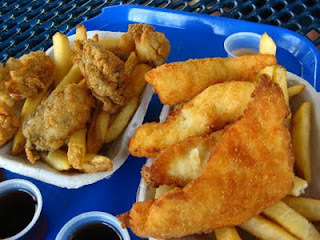 We shared the Fish’n Chips (Alaskan Cod), was ok, nothing out of the ordinary, didn’t make me want to get up and do a yummy dance or anything. 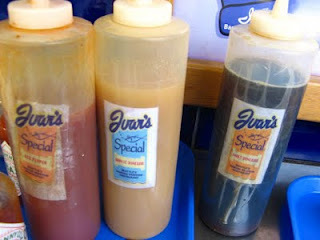 The Oysters’n Chips were fresh and good, but again, nothing out of this world… Best thing was their Flavored Vinegars, the hot and spicy and the garlic flavors were great with anything, so I’ll give them points for that. 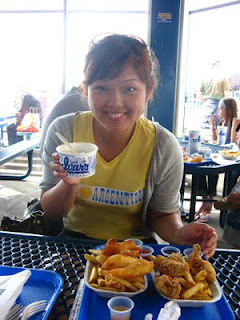 The Clam Chowder was suppose to be their specialty, their famous for it, so we had a cup each, I wish we didn’t. 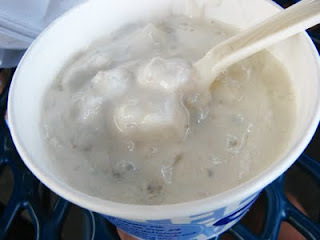 Sorry Evars, but I had way better chowda’ here in the East Coast. 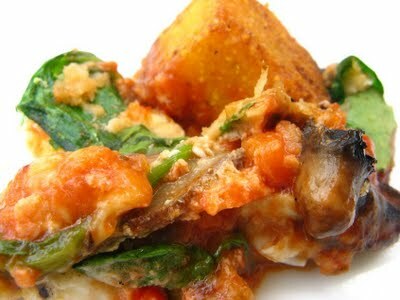 This was extra thick, and peppery, but clams were no were to be found, only potatoes and it lacked seasoning. 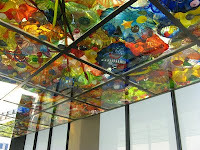 Walked around downtown Seattle, saw some really cool art, went to the first starbucks, watched the famous guys throw fish around, had the juiciest nectarine, and bought dark chocolate and sweet potato parppardelle (will make them soon). Ahhh… so much to do, so little time. 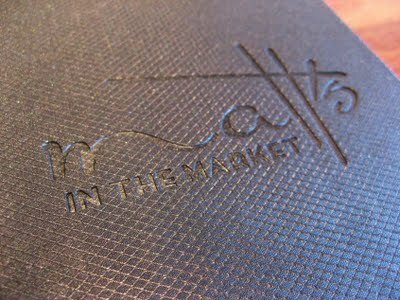 Small joint in the heart of the Pike Market, where fresh ingredients are abundant, genius. 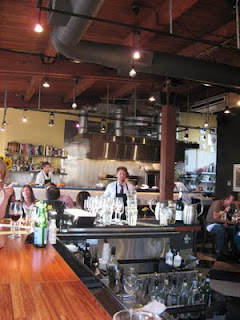 An open kitchen and a brigade of youthful men and women turning out stunningly beautiful food. Table’s need to be reserved way ahead of time, specially if you want the romantic view of the famous Pike Sign, though we were quite content by the bar, chatting with the friendly bartender, and fellow diner. Everyone seem to radiate this vibe, this passion for food, I loved it! 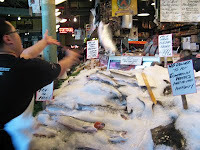 And daily specials of whole crispy fish (with head attached, thank you very much) were flying out of the kitchen. Us on the other hand, had a loooong day and weren’t as hungry as I wished, I mean you saw how much we ate, but there was a little spare room for some dishes to be shared. 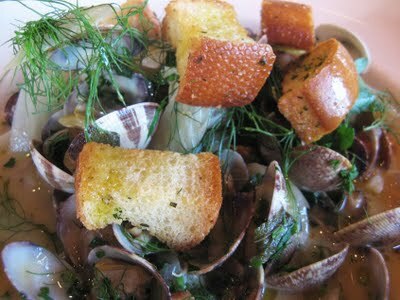 Manilla Clams, came in a licorice-like (from the fennel) clam stock, mixed with absinthe (distilled alcoholic drink from herbs and flowers, tastes like anise), herbs and butter croutons, so good, we drank all the soup. There was a savory umami taste, a lot of times, it’s achieved with MSG , but I’m pretty sure this wasn’t the case, since fresh seafood prepared usually brings it out naturally. 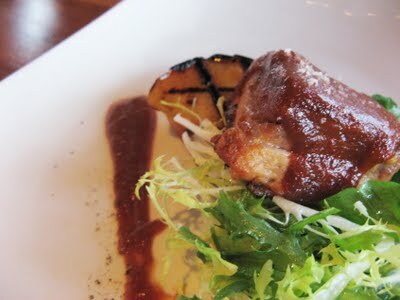 House Smoked BBQ pork belly was succulent, sweet, and tangy. The smoky aroma danced in my mouth, while the bbq sauce (tasted a bit like a japanese plum sauce) stayed in tune with the music of the sweet grilled peaces, and the peppery greens. Fabulous. 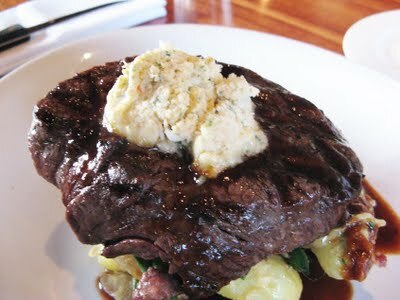 My friend ordered the special of the day, Filet Mignon topped with crab butter, over a bed of bak choy and red wine reduction. Juicy and tender, the flavors of the meat remained intact while the rest of the elements played quietly in the background. Everything was excellent so far, so there was no reason to go elsewhere for dessert. 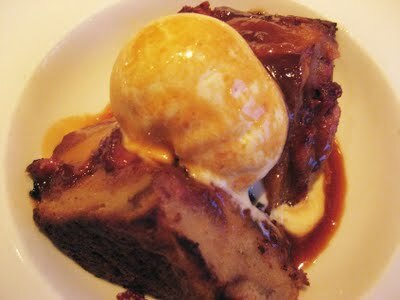 Raspberry & lemon bread pudding, was super moist, it had their house made vanilla ice cream, very rich and creamy plus the salted caramel. Sweet, salty, hint of tart, warm and cool, how can you go wrong, the only bad thing was that our tummy was getting really full. 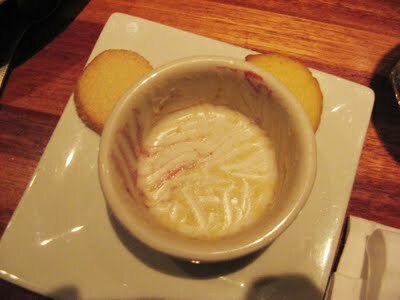 The bartender/waiter suggested the Sweet Corn Custard, as you can see from the picture, I finished it all. Sweet and creamy summer corn with a luscious blackberry compote. Divine, but too full to finish the lime-cornmeal cookies, they weren’t superb, so it was ok to leave them behind, plus it made a good mickey mouse. 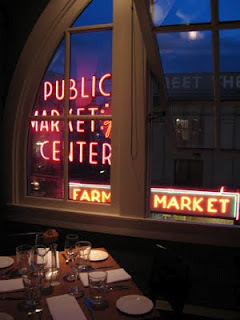 The night view of the restaurant with the market sign is really romantic and classic. 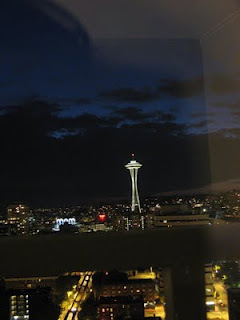 We had a good view of downtown Seattle and the Space Needle from our hotel room, I ended up visiting the Needle solo, very beautiful by night. Our first day was fruitful and plentiful. This place isn’t for the faint of heart, look into the open kitchen and you’ll see some serious bacon action going on, look at that pile! oh yeah, come to mama. There’s always a line, but the young hip workers keep their cool and send out some awesome creations. 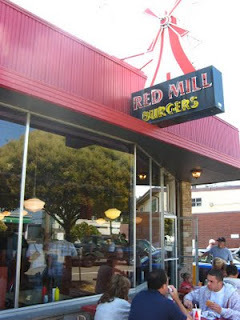 After studying the menu, I went for the Verde Beef Burger, juicy meat, cooked to perfection with open flames and your usual lettuce, tomato and red onions, but add to that their sweet and tangy fire roasted Anaheim peppers, melted jack cheese, and red mill sauce (home made mayo based goodness, very light and smokey), as if that wasn’t enough, I asked for bacon of course, salty, chewy, yet added another layer of deliciousness, all held together by a soft toasted kaiser roll. 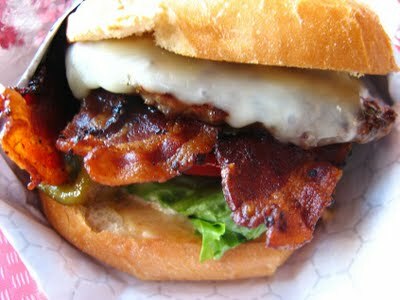 Loved it, as I’m writing this, I wish I had one right now, I’m drooling on my keyboard. And let’s not forget about their Onion Rings, big, tender, sweet, and extra crispy, I love how the coating taste like a Suncrisp Chip. 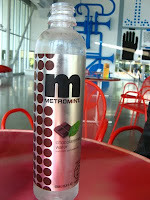 Walked around the Olympic Sculpture Park and had this really yummy Metromint’s Mint and Chocolate water, sorta like a Junior Mint in a bottle. 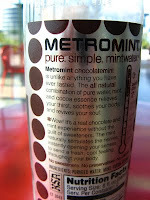 Just purified water, mint and cocoa essence, nothing more! 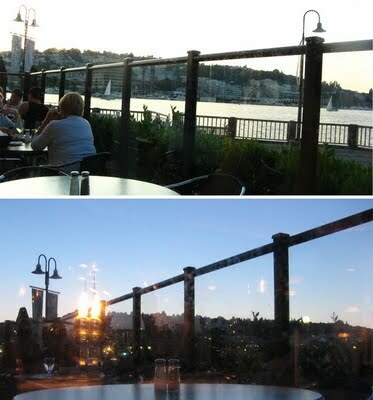 Has a really nice view and if you go during early dinner time, you can enjoy the sunset. 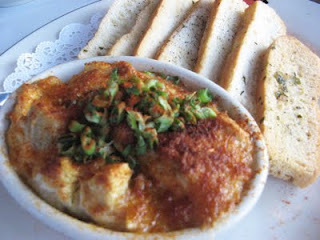 The hotel concierge also surprised us with the Dungeness Crab & Artichoke Dip. Very very creamy, it was too heavy for me, the cream cheese was overpowering, although there sure was a generous amount of crab and artichoke. 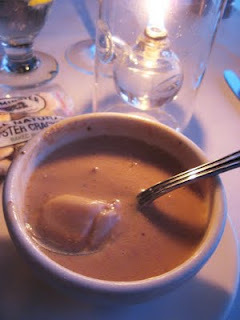 For dinner, I wasn’t too hungry so I got their “world famous” Whiskey Crab Soup, big lumps of crab meat in a creamy broth, very satisfying, the hint of alcohol gave it a smooth and sweet finish. I don’t know if it’s really world famous, but it was outstandingly yummy. 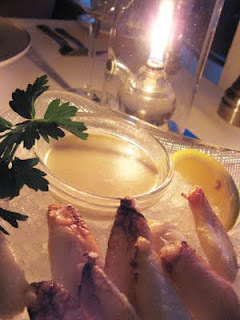 I was too lazy to eat a whole crab, so the Dungeness Crab Leg Cocktail was my best bet. Chilled and very sweet, super fresh, went very well with the dijon aioli. My friends had grilled fish which they both raved about. 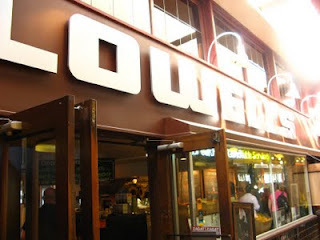 Prices are mid-high, but it was a nice last dinner in Seattle. 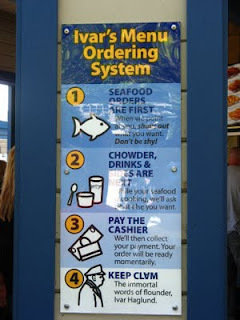 Nice view of the waters, order and pay first then get a seat, old school laid back kinda place. 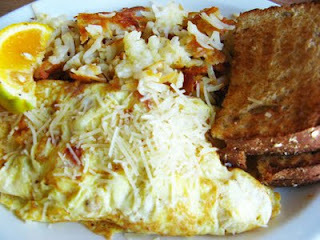 Dungeness Crab Omelette to start the day off. 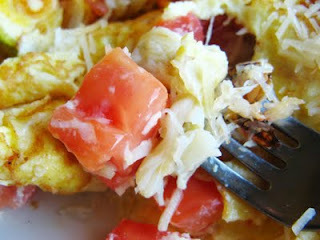 Good amount of lumb crab meat, juicy and sweet, with fresh tangy tomatoes and eggs, was a good beginning to a busy day. The hash brown was average and the toast was just toast, but overall I enjoyed it. 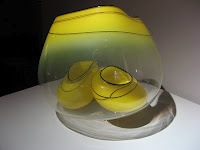 After breakfast it was goodbye to my friends (who had earlier flights) and I was off to Tacoma by bus ($3 each way) for the day, to see my favorite artist Dale Chihuly’s Glass Bridge. 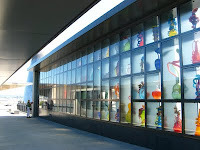 Sooo beautiful, the bridge crosses over to the Museum of Glass, which I got to see people blow glass and such, very fun. 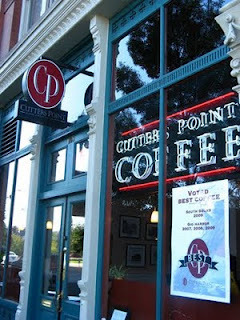 Right across from the Glass museum, on my way back to downtown, I stopped by Cutter’s Point and had the best Dark Chocolate Mocha ever. Deep rich flavors of melting dark chocolate and intense and smooth expresso and skim milk. I don’t know what handcrafted coffee involves, but whatever it is, those hands sure knew what they were doing. I would take a bus for an hour just to have the drink, yep, that good. 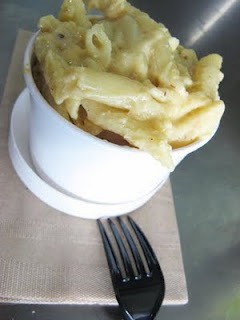 It really is THE BEST mac & cheese this chubby ever tasted. Very creamy, it has their flagship blend, some jack and spices. Pasta could be a tad more al dente, but since it’s not cooked to order, I can’t complain, plus the cheese is so good that I didn’t mind. A warm cup of cheesy heaven. Also tried the spicy one, but I would stick to the original, it’s much better, a more pure cheese flavor, doesn’t need to be all dressed up, no spicy kick necessary. Also grabbed a Piroshky from the Russian Bakery for the flight home, but it wasn’t that memorable, so let’s just end my trip on a cheesy note. 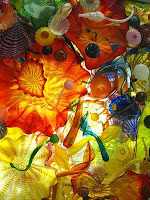 Seattle was beautiful and yummy. 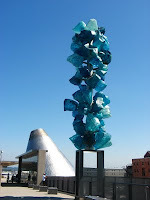 I’m trying to visit places only once (since the world is so big), but if I were ever in the area, Seattle would be a great place to revisit. yum! i gained 5 lbs just looking at your pictures! 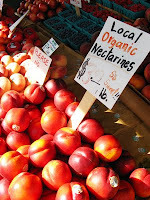 i will be posting portland, oregon and montreal eats this week too! 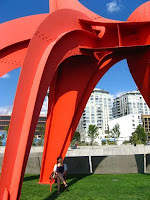 Seattle is my hometown! Actually, I'm from Silverdale, which is closer to Bainbridge. It looks like you had a great time! 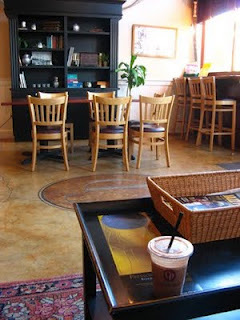 I will have to try some of these new places. Keep up the great reviews! Oh si! 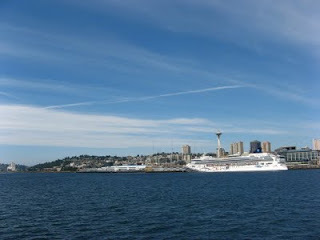 Seattle is so beautiful!!! 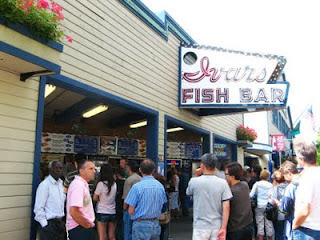 didn't know you were from or I would of asked you for some recommendations… Seattle was yummy! Wow! It's happy travel. 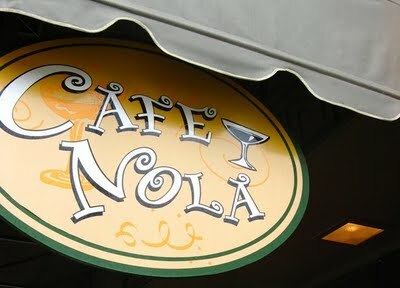 Delicous food and beautiful city. Gorgeous! !